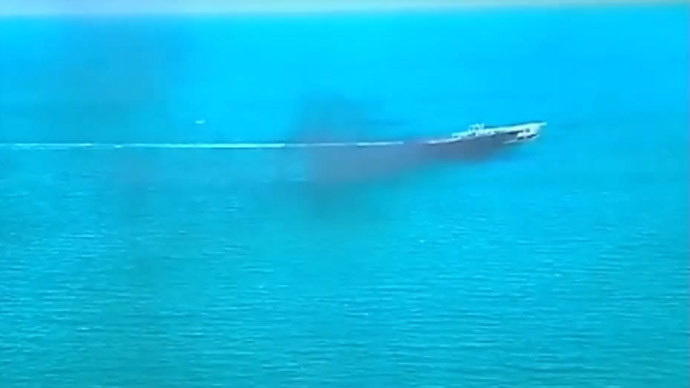 A still from a news broadcast by Press TV showing the Iranian navy blowing up a 'mock' US aircraft carrier. Iran has staged naval war games in an important sea channel, including an attack on a mock US warship. Missiles were also fired from the coast around the Strait of Hormuz, which sees a quarter of all sea-transported oil pass through it. The drills were conducted by Iran’s Revolutionary Guard, which were named Prophet 9. The exercises saw dozens of gunboats making a beeline towards a built-to-scale American aircraft carrier, before bombarding it with cruise missiles and ballistic missiles. Iranian helicopters also joined in the action, firing two cruise missiles at the 202-meter aircraft carrier. "American aircraft carriers are very big ammunition depots housing a lot of missiles, rockets, torpedoes and everything else," Navy chief Admiral Ali Fadavi said on state television, as reported by AP. He added that a direct missile strike on a vessel such as the aircraft carrier could set off a large secondary explosion. The Guard's chief commander, General Mohammad Ali Jafari added that the aircraft carrier had been specially-built last April in order to be destroyed. "The Americans, and the entire world, know that the American Navy is one of our targets, and it will take us 50 seconds to destroy every US warship," Jafari added, the Jerusalem Post reported. Iranian gunboats also carried out other exercises during the drills, such as laying sea mines and shooting down a drone. Reports also stated that Tehran fired surface-to-sea missiles, which can travel more than 5km and can avoid radar detection. Iran regularly carries out naval war games in the region, though this is the first time that a mock US aircraft carrier has been used. At one point, a camera from state TV panned across a banner which read: "If the Americans are ready to be buried at the bottom of the waters of the Persian Gulf - so be it," a quote from Iran's first Supreme Leader, Ayatollah Ruhollah Khomeini, Reuters reported. Tehran has repeatedly said its defense doctrine is based on deterrence and poses no threat against other countries. It views the Strait of Hormuz and the Persian Gulf as its backyard and says it has a legitimate claim in looking to expand its influence there. Iran is keen to assert its influence within the Persian Gulf given the latter’s economic and political importance. Tehran has often said that it is prepared to block the Strait of Hormuz if it ever came under military attack. Given around 25 percent of all the world’s oil, which is transported by sea, travels through the passage, any disruption could lead to a steep hike in oil prices and disrupt global financial markets. Jafari said the drills send a "message of [Iran's] might" to "extraterritorial powers," a reference to the United States. Meanwhile, Ali Larijani who attended the drills and is also the Iranian parliament’s speaker, said Iran would keep on spending to boost its defenses. "With attention to the situation in the region, we have noticeably expanded the defense budget of the armed forces to ensure the stable security of the region," Larijani told a news conference before the exercises, according to Fars News. In December, Iran conducted six days of drills in the Strait of Hormuz in which it tested warships and submarines, while also testing a suicide drone able to hit aerial and ground targets, as well as ships. The drone, which is known as Yasir, is equipped with state-of-art, light cameras for reconnaissance. It can fly for eight hours with a range of 200km and reach an altitude of 4,500 meters. Brigadier General Abdolrahim Mousavi, Chief of the Joint Headquarters of the Army said the purpose of the drills in December was to convey a message of peace and friendship to neighboring states and underscore the defensive nature of Iran’s military doctrine.